Lease the first-ever 2019 X7 for $959/month* + tax for 36 months. Sunroof, 3rd Row Seat, NAV, Heated Seats, Rear Air, Satellite Radio, Power Liftgate, PARKING ASSISTANCE PACKAGE, DRIVING ASSISTANCE PROFESSIONAL PACKA... SPORT SEATS, Alloy Wheels, Panoramic Roof, All Wheel Drive, Turbo. Black Sapphire Metallic exterior and Cognac Vernasca Leather interior, xDrive40i trim. Warranty 4 yrs/50k Miles - Drivetrain Warranty; KEY FEATURES INCLUDE Third Row Seat, Navigation, Panoramic Roof, Power Liftgate, Rear Air, Heated Driver Seat, Turbocharged, Satellite Radio, iPod/MP3 Input, Keyless Start, Dual Zone A/C, Cross-Traffic Alert, WiFi Hotspot, Blind Spot Monitor, Smart Device Integration Rear Spoiler, MP3 Player, Sunroof, All Wheel Drive, Onboard Communications System. OPTION PACKAGES DRIVING ASSISTANCE PROFESSIONAL PACKAGE ACC w/stop and go, Active Lane Keeping Assistant w/side collision avoidance, steering and Traffic Jam Assistant, Automatic Lane Change, evasion assistant and cross-traffic alert front, Extended Traffic Jam Assistant For limited access highways, Active Driving Assistant Pro, PARKING ASSISTANCE PACKAGE Rear View Camera, Surround View w/3D View WHY BUY FROM US Welcome to Reeves Import Motorcars, a family owned and operated business since 1971. On behalf of our staff, thank you for visiting us on the Web and giving us an opportunity to acquaint you with our dealership. Our commitment to perfection is exceeded only by our resolve to offer you the highest levels of guest services in the luxury automotive industry. Our professional and well trained staff is ready to assist you with your new or pre-owned automotive needs. While every reasonable effort is made to ensure the accuracy of this information, we are not responsible for any errors or omissions contained on these pages. All offers are mutually exclusive. All vehicles subject to prior sale. Please verify any informa Horsepower calculations based on trim engine configuration. Please confirm the accuracy of the included equipment by calling us prior to purchase. Third Row Seat, Moonroof, Navigation, Heated Seats, Rear Air, Satellite Radio, Power Liftgate, PARKING ASSISTANCE PACKAGE, DRIVING ASSISTANCE PROFESSIONAL PACKA... SPORT SEATS, Aluminum Wheels, All Wheel Drive, Panoramic Roof, Turbo Charged. xDrive40i trim, Black Sapphire Metallic exterior and Coffee Vernasca Leather interior. Warranty 4 yrs/50k Miles - Drivetrain Warranty; KEY FEATURES INCLUDE Third Row Seat, Navigation, Panoramic Roof, Power Liftgate, Rear Air, Heated Driver Seat, Turbocharged, Satellite Radio, iPod/MP3 Input, Keyless Start, Dual Zone A/C, Cross-Traffic Alert, WiFi Hotspot, Blind Spot Monitor, Smart Device Integration Rear Spoiler, MP3 Player, Sunroof, All Wheel Drive, Onboard Communications System. OPTION PACKAGES DRIVING ASSISTANCE PROFESSIONAL PACKAGE ACC w/stop and go, Active Lane Keeping Assistant w/side collision avoidance, steering and Traffic Jam Assistant, Automatic Lane Change, evasion assistant and cross-traffic alert front, Extended Traffic Jam Assistant For limited access highways, Active Driving Assistant Pro, PARKING ASSISTANCE PACKAGE Rear View Camera MORE ABOUT US Welcome to Reeves Import Motorcars, a family owned and operated business since 1971. On behalf of our staff, thank you for visiting us on the Web and giving us an opportunity to acquaint you with our dealership. Our commitment to perfection is exceeded only by our resolve to offer you the highest levels of guest services in the luxury automotive industry. Our professional and well trained staff is ready to assist you with your new or pre-owned automotive needs. While every reasonable effort is made to ensure the accuracy of this information, we are not responsible for any errors or omissions contained on these pages. All offers are mutually exclusive. All vehicles subject to prior sale. Please verify any informa Horsepower calculations based on trim engine configuration. Please confirm the accuracy of the included equipment by calling us prior to purchase. NAV, Sunroof, Heated Seats, 3rd Row Seat, All Wheel Drive, Panoramic Roof, Power Liftgate, Rear Air, Turbo, SECOND-ROW CAPTAIN'S CHAIRS, DRIVING ASSISTANCE PROFESSIONAL PACKA... ALUMINUM RUNNING BOARDS, HEATED FRONT SEATS ARMRESTS & STEERIN... LUXURY SEATING PACKAGE, Quad Seats, Alloy Wheels, PARKING ASSISTANCE PACKAGE, PREMIUM PACKAGE. Black Sapphire Metallic exterior and Black Vernasca Leather interior, xDrive40i trim. Warranty 4 yrs/50k Miles - Drivetrain Warranty; KEY FEATURES INCLUDE Third Row Seat, Navigation, Panoramic Roof, Power Liftgate, Rear Air, Turbocharged, Satellite Radio, iPod/MP3 Input, Dual Zone A/C, Cross-Traffic Alert, WiFi Hotspot, Blind Spot Monitor, Smart Device Integration, Hands-Free Liftgate Rear Spoiler, MP3 Player, Sunroof, All Wheel Drive, Onboard Communications System. OPTION PACKAGES PREMIUM PACKAGE Rear Electric Side Window Shades, harman/kardon Surround Sound System, Head-Up Display, Heated & Cooled Cup Holders, Soft-Close Automatic Doors, Remote Engine Start, Gesture Control, DRIVING ASSISTANCE PROFESSIONAL PACKAGE ACC w/stop and go BUY FROM AN AWARD WINNING DEALER Welcome to Reeves Import Motorcars, a family owned and operated business since 1971. On behalf of our staff, thank you for visiting us on the Web and giving us an opportunity to acquaint you with our dealership. Our commitment to perfection is exceeded only by our resolve to offer you the highest levels of guest services in the luxury automotive industry. Our professional and well trained staff is ready to assist you with your new or pre-owned automotive needs. While every reasonable effort is made to ensure the accuracy of this information, we are not responsible for any errors or omissions contained on these pages. All offers are mutually exclusive. All vehicles subject to prior sale. Please verify any informa Horsepower calculations based on trim engine configuration. Please confirm the accuracy of the included equipment by calling us prior to purchase. Third Row Seat, Nav System, Heated Seats, Moonroof, Quad Bucket Seats, Hitch, Turbo Charged Engine, WHEELS: 22 X 9.5 FR & 22 X 10.5 R... All Wheel Drive, DRIVING ASSISTANCE PROFESSIONAL PACKA... LUXURY SEATING PACKAGE, HEATED FRONT SEATS ARMRESTS & STEERIN... SECOND-ROW CAPTAIN'S CHAIRS, PARKING ASSISTANCE PACKAGE, ALUMINUM RUNNING BOARDS, PREMIUM PACKAGE. Mineral White Metallic exterior and Canberra Beige Vernasca Leathe interior, xDrive40i trim. KEY FEATURES INCLUDE Third Row Seat, Navigation, Power Liftgate, Rear Air, Turbocharged, Satellite Radio, iPod/MP3 Input, Dual Zone A/C, Cross-Traffic Alert, WiFi Hotspot, Hands-Free Liftgate, Smart Device Integration, Blind Spot Monitor Rear Spoiler, MP3 Player, All Wheel Drive, Onboard Communications System, Remote Trunk Release. OPTION PACKAGES PREMIUM PACKAGE Rear Electric Side Window Shades, harman/kardon Surround Sound System, Head-Up Display, Heated & Cooled Cup Holders, Soft-Close Automatic Doors, Remote Engine Start, Gesture Control, DRIVING ASSISTANCE PROFESSIONAL PACKAGE ACC w/stop and go BUY FROM AN AWARD WINNING DEALER Welcome to Reeves Import Motorcars, a family owned and operated business since 1971. On behalf of our staff, thank you for visiting us on the Web and giving us an opportunity to acquaint you with our dealership. Our commitment to perfection is exceeded only by our resolve to offer you the highest levels of guest services in the luxury automotive industry. Our professional and well trained staff is ready to assist you with your new or pre-owned automotive needs. While every reasonable effort is made to ensure the accuracy of this information, we are not responsible for any errors or omissions contained on these pages. All offers are mutually exclusive. All vehicles subject to prior sale. Please verify any informa Horsepower calculations based on trim engine configuration. Please confirm the accuracy of the included equipment by calling us prior to purchase. Heated Seats, Navigation, Moonroof, Third Row Seat, Power Liftgate, Back-Up Camera, Panoramic Roof, LUXURY SEATING PACKAGE, COLD WEATHER PACKAGE, WHEELS: 22 X 9.5 FR & 22 X 10.5 R... M SPORT PACKAGE, Turbo Charged, All Wheel Drive, PREMIUM PACKAGE. xDrive40i trim, Black Sapphire Metallic exterior and Black Extended Merino Leather interior. Warranty 4 yrs/50k Miles - Drivetrain Warranty; KEY FEATURES INCLUDE Third Row Seat, Navigation, Panoramic Roof, Power Liftgate, Back-Up Camera, Turbocharged, Satellite Radio, iPod/MP3 Input, Cross-Traffic Alert, Blind Spot Monitor, WiFi Hotspot, Smart Device Integration, Hands-Free Liftgate Rear Spoiler, MP3 Player, Sunroof, All Wheel Drive, Onboard Communications System. OPTION PACKAGES PREMIUM PACKAGE Rear Electric Side Window Shades, harman/kardon Surround Sound System, Head-Up Display, Heated & Cooled Cup Holders, Soft-Close Automatic Doors, Remote Engine Start, Gesture Control, M SPORT PACKAGE Wheels: 21 x 9.5 Double-Spoke Bi-Color Orbit Grey (Style 754M), Anthracite Alcantara Headliner, Without Lines Designation Outside BUY FROM AN AWARD WINNING DEALER Welcome to Reeves Import Motorcars, a family owned and operated business since 1971. On behalf of our staff, thank you for visiting us on the Web and giving us an opportunity to acquaint you with our dealership. Our commitment to perfection is exceeded only by our resolve to offer you the highest levels of guest services in the luxury automotive industry. Our professional and well trained staff is ready to assist you with your new or pre-owned automotive needs. While every reasonable effort is made to ensure the accuracy of this information, we are not responsible for any errors or omissions contained on these pages. All offers are mutually exclusive. All vehicles subject to prior sale. Please verify any informa Horsepower calculations based on trim engine configuration. Please confirm the accuracy of the included equipment by calling us prior to purchase. NAV, Heated Seats, 3rd Row Seat, Sunroof, All Wheel Drive, Turbo, PANORAMIC SKY LOUNGE LED ROOF, TRAILER HITCH - 7,500 LB TOWING LIMIT... WHEELS: 22 X 9.5 FR & 22 X 10.5 R... PREMIUM PACKAGE, PARKING ASSISTANCE PACKAGE, M SPORT PACKAGE, LUXURY SEATING PACKAGE, COLD WEATHER PACKAGE, Tow Hitch, DRIVING ASSISTANCE PROFESSIONAL PACKA... Black Sapphire Metallic exterior and Coffee Vernasca Leather interior, xDrive40i trim. KEY FEATURES INCLUDE Third Row Seat, Navigation, Power Liftgate, Turbocharged, Satellite Radio, iPod/MP3 Input, Smart Device Integration, Cross-Traffic Alert, Hands-Free Liftgate, WiFi Hotspot, Blind Spot Monitor. Rear Spoiler, MP3 Player, All Wheel Drive, Onboard Communications System, Keyless Entry. OPTION PACKAGES PREMIUM PACKAGE Rear Electric Side Window Shades, harman/kardon Surround Sound System, Head-Up Display, Heated & Cooled Cup Holders, Soft-Close Automatic Doors, Remote Engine Start, Gesture Control, M SPORT PACKAGE Wheels: 21 x 9.5 Double-Spoke Bi-Color Orbit Grey (Style 754M), Anthracite Alcantara Headliner, Without Lines Designation Outside WHY BUY FROM US Welcome to Reeves Import Motorcars, a family owned and operated business since 1971. On behalf of our staff, thank you for visiting us on the Web and giving us an opportunity to acquaint you with our dealership. Our commitment to perfection is exceeded only by our resolve to offer you the highest levels of guest services in the luxury automotive industry. Our professional and well trained staff is ready to assist you with your new or pre-owned automotive needs. While every reasonable effort is made to ensure the accuracy of this information, we are not responsible for any errors or omissions contained on these pages. All offers are mutually exclusive. All vehicles subject to prior sale. Please verify any informa Horsepower calculations based on trim engine configuration. Please confirm the accuracy of the included equipment by calling us prior to purchase. 3rd Row Seat, NAV, Sunroof, Heated Seats, Quad Seats, Tow Hitch, Turbo, PREMIUM PACKAGE, All Wheel Drive, WHEELS: 22 X 9.5 FR & 22 X 10.5 R... LUXURY SEATING PACKAGE, M SPORT PACKAGE, SECOND-ROW CAPTAIN'S CHAIRS, DRIVING ASSISTANCE PROFESSIONAL PACKA... TRAILER HITCH - 7,500 LB TOWING LIMIT... HEATED FRONT SEATS ARMRESTS & STEERIN... PARKING ASSISTANCE PACKAGE. xDrive40i trim, Mineral White Metallic exterior and Black Vernasca Leather interior. KEY FEATURES INCLUDE Third Row Seat, Navigation, Power Liftgate, Rear Air, Turbocharged, Satellite Radio, iPod/MP3 Input, Dual Zone A/C, Hands-Free Liftgate, Cross-Traffic Alert, Smart Device Integration, WiFi Hotspot, Blind Spot Monitor. Rear Spoiler, MP3 Player, All Wheel Drive, Onboard Communications System, Keyless Entry. OPTION PACKAGES PREMIUM PACKAGE Rear Electric Side Window Shades, harman/kardon Surround Sound System, Head-Up Display, Heated & Cooled Cup Holders, Soft-Close Automatic Doors, Remote Engine Start, Gesture Control, M SPORT PACKAGE Wheels: 21 x 9.5 Double-Spoke Bi-Color Orbit Grey (Style 754M), Anthracite Alcantara Headliner MORE ABOUT US Welcome to Reeves Import Motorcars, a family owned and operated business since 1971. On behalf of our staff, thank you for visiting us on the Web and giving us an opportunity to acquaint you with our dealership. Our commitment to perfection is exceeded only by our resolve to offer you the highest levels of guest services in the luxury automotive industry. Our professional and well trained staff is ready to assist you with your new or pre-owned automotive needs. While every reasonable effort is made to ensure the accuracy of this information, we are not responsible for any errors or omissions contained on these pages. All offers are mutually exclusive. All vehicles subject to prior sale. Please verify any informa Horsepower calculations based on trim engine configuration. Please confirm the accuracy of the included equipment by calling us prior to purchase. NAV, Sunroof, Heated Leather Seats, 3rd Row Seat, Turbo, All Wheel Drive, Quad Seats, HEATED FRONT SEATS ARMRESTS & STEERIN... TRAILER HITCH - 7,500 LB TOWING LIMIT... WHEELS: 22 X 9.5 FR & 22 X 10.5 R... SECOND-ROW CAPTAIN'S CHAIRS, PREMIUM PACKAGE, Tow Hitch, LUXURY SEATING PACKAGE. Arctic Grey Metallic exterior and Black Vernasca Leather interior, xDrive50i trim. Warranty 4 yrs/50k Miles - Drivetrain Warranty; KEY FEATURES INCLUDE Leather Seats, Third Row Seat, Navigation, Panoramic Roof, Power Liftgate, Rear Air, Back-Up Camera, Turbocharged, Premium Sound System, Satellite Radio, iPod/MP3 Input, Dual Zone A/C, Smart Device Integration, Cross-Traffic Alert, WiFi Hotspot. Rear Spoiler, MP3 Player, Sunroof, All Wheel Drive, Onboard Communications System. OPTION PACKAGES PREMIUM PACKAGE Rear Electric Side Window Shades, Heated & Cooled Cup Holders, Soft-Close Automatic Doors, Remote Engine Start, Gesture Control, WHEELS: 22 X 9.5 FR & 22 X 10.5 RR Y-SPOKE (Style 758i), Bi-color orbit grey, Tires: P275/40R22 Fr & P315/35R22 Rr Run-Flat BUY FROM AN AWARD WINNING DEALER Welcome to Reeves Import Motorcars, a family owned and operated business since 1971. On behalf of our staff, thank you for visiting us on the Web and giving us an opportunity to acquaint you with our dealership. Our commitment to perfection is exceeded only by our resolve to offer you the highest levels of guest services in the luxury automotive industry. Our professional and well trained staff is ready to assist you with your new or pre-owned automotive needs. While every reasonable effort is made to ensure the accuracy of this information, we are not responsible for any errors or omissions contained on these pages. All offers are mutually exclusive. All vehicles subject to prior sale. Please verify any informa Horsepower calculations based on trim engine configuration. Please confirm the accuracy of the included equipment by calling us prior to purchase. Heated Leather Seats, 3rd Row Seat, Navigation, Sunroof, Back-Up Camera, Power Liftgate, ALUMINUM RUNNING BOARDS, WHEELS: 22 X 9.5 FR & 22 X 10.5 R... Turbo Charged, DYNAMIC HANDLING PACKAGE, PREMIUM PACKAGE, WHEELS: 22 X 9.5 FR & 22 X 10.5 RR MULTI-SPOKE, Panoramic Roof, All Wheel Drive, COLD WEATHER PACKAGE. Mineral White Metallic exterior and Black Vernasca Leather interior, xDrive50i trim. Warranty 4 yrs/50k Miles - Drivetrain Warranty; KEY FEATURES INCLUDE Leather Seats, Third Row Seat, Navigation, Panoramic Roof, Power Liftgate, Back-Up Camera, Turbocharged, Premium Sound System, Satellite Radio, iPod/MP3 Input, Smart Device Integration, Blind Spot Monitor, WiFi Hotspot, Cross-Traffic Alert, Hands-Free Liftgate. Rear Spoiler, MP3 Player, Sunroof, All Wheel Drive, Onboard Communications System. OPTION PACKAGES DYNAMIC HANDLING PACKAGE Integral Active Steering, M Sport Differential, Active Comfort Drive w/Road Preview, M Sport Brakes, PREMIUM PACKAGE Rear Electric Side Window Shades, Heated & Cooled Cup Holders, Soft-Close Automatic Doors, Remote Engine Start, Gesture Control WHO WE ARE Welcome to Reeves Import Motorcars, a family owned and operated business since 1971. On behalf of our staff, thank you for visiting us on the Web and giving us an opportunity to acquaint you with our dealership. Our commitment to perfection is exceeded only by our resolve to offer you the highest levels of guest services in the luxury automotive industry. Our professional and well trained staff is ready to assist you with your new or pre-owned automotive needs. While every reasonable effort is made to ensure the accuracy of this information, we are not responsible for any errors or omissions contained on these pages. All offers are mutually exclusive. All vehicles subject to prior sale. Please verify any informa Horsepower calculations based on trim engine configuration. Please confirm the accuracy of the included equipment by calling us prior to purchase. Navigation, Heated Leather Seats, Sunroof, 3rd Row Seat, SECOND-ROW CAPTAIN'S CHAIRS, LUXURY SEATING PACKAGE, All Wheel Drive, WHEELS: 22 X 9.5 FR & 22 X 10.5 R... TRAILER HITCH - 7,500 LB TOWING LIMIT... HEATED FRONT SEATS ARMRESTS & STEERIN... M SPORT PACKAGE, EXECUTIVE PACKAGE, PREMIUM PACKAGE, Turbo Charged, Captains Chairs, Trailer Hitch. Black Sapphire Metallic exterior and Black Vernasca Leather interior, xDrive50i trim. KEY FEATURES INCLUDE Leather Seats, Third Row Seat, Navigation, Power Liftgate, Rear Air, Back-Up Camera, Turbocharged, Premium Sound System, Satellite Radio, iPod/MP3 Input, Dual Zone A/C, Smart Device Integration, Cross-Traffic Alert, WiFi Hotspot, Hands-Free Liftgate. Rear Spoiler, MP3 Player, All Wheel Drive, Onboard Communications System, Privacy Glass. OPTION PACKAGES M SPORT PACKAGE M Sport Exhaust System, Wheels: 21 x 9.5 Double-Spoke Bi-Color Orbit Grey (Style 754M), Anthracite Alcantara Headliner, Without Lines Designation Outside, Shadowline Exterior Trim, Aerodynamic Kit, High-Gloss Shadowline Roof Rails, Fineline Black Wood Trim BUY FROM AN AWARD WINNING DEALER Welcome to Reeves Import Motorcars, a family owned and operated business since 1971. On behalf of our staff, thank you for visiting us on the Web and giving us an opportunity to acquaint you with our dealership. Our commitment to perfection is exceeded only by our resolve to offer you the highest levels of guest services in the luxury automotive industry. Our professional and well trained staff is ready to assist you with your new or pre-owned automotive needs. While every reasonable effort is made to ensure the accuracy of this information, we are not responsible for any errors or omissions contained on these pages. All offers are mutually exclusive. All vehicles subject to prior sale. Please verify any informa Horsepower calculations based on trim engine configuration. Please confirm the accuracy of the included equipment by calling us prior to purchase. Moonroof, Navigation, Heated Leather Seats, Third Row Seat, Turbo Charged, Captains Chairs, WHEELS: 22 X 9.5 FR & 22 X 10.5 R... All Wheel Drive, PREMIUM PACKAGE, EXECUTIVE PACKAGE, LUXURY SEATING PACKAGE, M SPORT PACKAGE, Trailer Hitch, TRAILER HITCH - 7,500 LB TOWING LIMIT... COLD WEATHER PACKAGE, SECOND-ROW CAPTAIN'S CHAIRS. Black Sapphire Metallic exterior and Black Vernasca Leather interior, xDrive50i trim. Warranty 4 yrs/50k Miles - Drivetrain Warranty; KEY FEATURES INCLUDE Leather Seats, Third Row Seat, Navigation, Power Liftgate, Back-Up Camera, Turbocharged, Premium Sound System, Satellite Radio, iPod/MP3 Input, Smart Device Integration, Cross-Traffic Alert, WiFi Hotspot, Hands-Free Liftgate, Lane Keeping Assist, Blind Spot Monitor Rear Spoiler, MP3 Player, All Wheel Drive, Onboard Communications System, Privacy Glass. OPTION PACKAGES M SPORT PACKAGE M Sport Exhaust System, Wheels: 21 x 9.5 Double-Spoke Bi-Color Orbit Grey (Style 754M), Anthracite Alcantara Headliner, Without Lines Designation Outside, Shadowline Exterior Trim, Aerodynamic Kit, High-Gloss Shadowline Roof Rails VISIT US TODAY Welcome to Reeves Import Motorcars, a family owned and operated business since 1971. On behalf of our staff, thank you for visiting us on the Web and giving us an opportunity to acquaint you with our dealership. Our commitment to perfection is exceeded only by our resolve to offer you the highest levels of guest services in the luxury automotive industry. Our professional and well trained staff is ready to assist you with your new or pre-owned automotive needs. While every reasonable effort is made to ensure the accuracy of this information, we are not responsible for any errors or omissions contained on these pages. All offers are mutually exclusive. All vehicles subject to prior sale. Please verify any informa Horsepower calculations based on trim engine configuration. Please confirm the accuracy of the included equipment by calling us prior to purchase. DVD, 3rd Row Seat, NAV, Sunroof, Heated Leather Seats, Turbo, Quad Seats, WHEELS: 22 X 9.5 FR & 22 X 10.5 R... All Wheel Drive, SECOND-ROW CAPTAIN'S CHAIRS, M SPORT PACKAGE, PREMIUM PACKAGE, DYNAMIC HANDLING PACKAGE, LUXURY SEATING PACKAGE, BOWERS & WILKINS DIAMOND SURROUND SOU... REAR-SEAT ENTERTAINMENT PROFESSIONAL, EXECUTIVE PACKAGE, COLD WEATHER PACKAGE. Arctic Grey Metallic exterior and Black Extended Merino Leather interior, xDrive50i trim. KEY FEATURES INCLUDE Leather Seats, Third Row Seat, Navigation, Power Liftgate, Back-Up Camera, Turbocharged, Satellite Radio, iPod/MP3 Input, Lane Keeping Assist, Hands-Free Liftgate, Blind Spot Monitor, WiFi Hotspot, Smart Device Integration, Cross-Traffic Alert, Heated Leather Seats. Rear Spoiler, MP3 Player, All Wheel Drive, Onboard Communications System, Keyless Entry. OPTION PACKAGES DYNAMIC HANDLING PACKAGE Integral Active Steering, M Sport Differential, Active Comfort Drive w/Road Preview, M Sport Brakes, M SPORT PACKAGE M Sport Exhaust System, Wheels: 21 x 9.5 Double-Spoke Bi-Color Orbit Grey (Style 754M), Anthracite Alcantara Headliner WHO WE ARE Welcome to Reeves Import Motorcars, a family owned and operated business since 1971. On behalf of our staff, thank you for visiting us on the Web and giving us an opportunity to acquaint you with our dealership. Our commitment to perfection is exceeded only by our resolve to offer you the highest levels of guest services in the luxury automotive industry. Our professional and well trained staff is ready to assist you with your new or pre-owned automotive needs. While every reasonable effort is made to ensure the accuracy of this information, we are not responsible for any errors or omissions contained on these pages. All offers are mutually exclusive. All vehicles subject to prior sale. Please verify any informa Horsepower calculations based on trim engine configuration. Please confirm the accuracy of the included equipment by calling us prior to purchase. 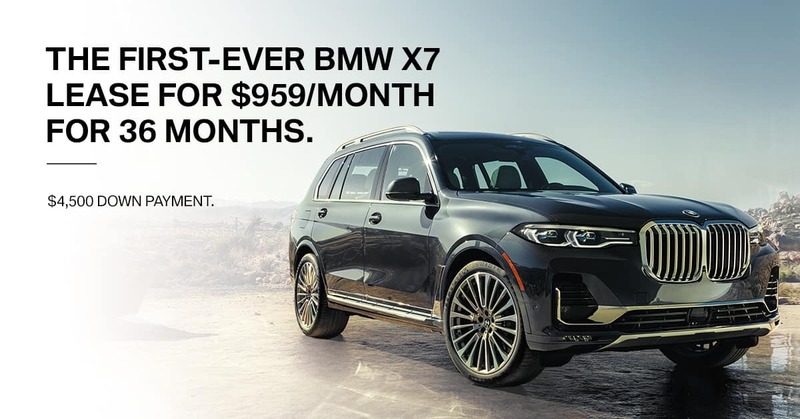 *Lease offer applies to new 2019 BMW X7 SAV models. Cash due at signing includes $4,500 customer down, first payment, tax, title, license, registration feeds, $596.20 dealer fee, and $925 acquisition fee. Monthly lease payments are $959 per month plus tax for 36 months at 7,500 miles per year. Valid through 4/30/19. Must be financed through BMW Financial Services to eligible, qualified customers with excellent credit history who meet BMW Financial Services’ credit requirements. All incentives and rebates included, including Loyalty, Corporate, and USAA. Please see your client advisor for details.